Over the course of the year, I try to collect as many arts and crafts kits as I can for these long, cold winter days. 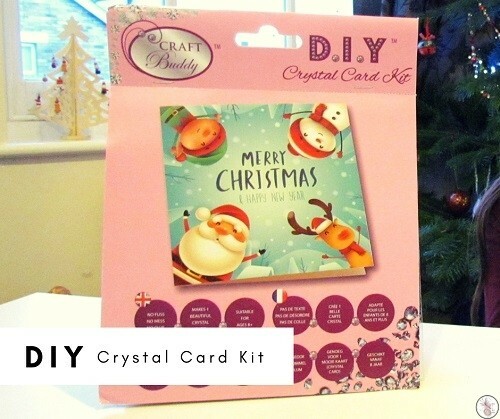 One such kit I was recently sent is a DIY Crystal Card Kit from Craft Buddy. 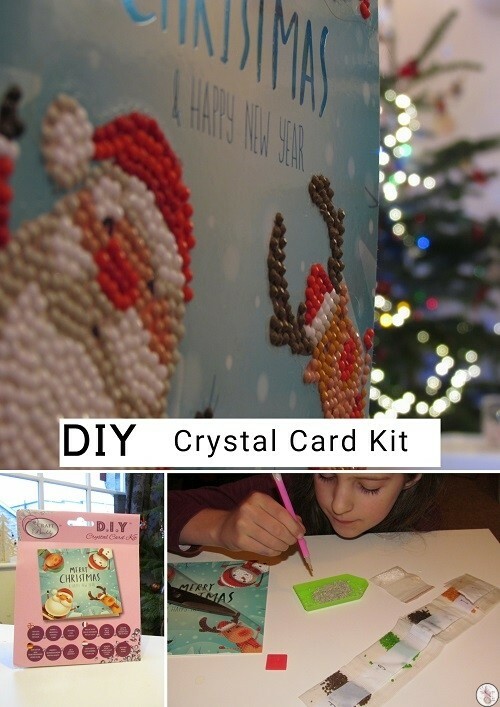 This kit makes one crystal embellished Christmas Card and is available at Crystal Card Kits for £4.99. I was surprised to find that there’s only one card in the kit, making it quite expensive for a Christmas card, but as an activity that took a couple of hours and actually managed to keep Ameli’s attention it’s pretty good value for money for an afternoon of peace and quiet! 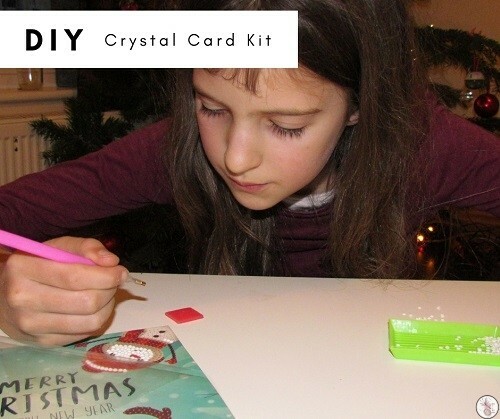 The kit contains the card with it’s ‘paint my number’ style numbering, a pen tool for picking up crystals and the crystals themselves. There’s also a wax square to make the crystals stick to the pen tool and a tray for pouring the beads into. 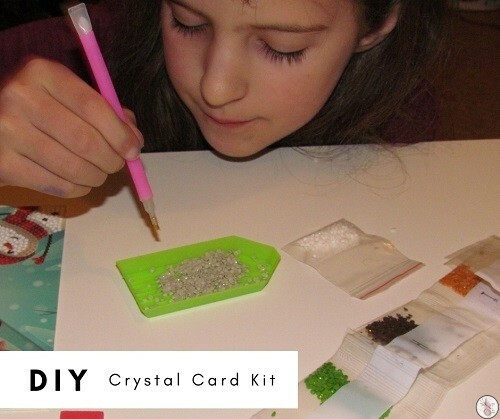 You’ll also find a few resealable baggies for the leftover crystals. To start off, you dip the pen tool tip into the wax, then use it to pick up the crystal. The card is covered by a plastic sleeve, and since the paint by number bits are self-adhesive, pulling just a bit of the plastic at a time off is good to stop it losing it’s sticky. Once you’ve covered all the numbers, you’re left with a few extra crystals, I’m guessing either so you have spares if you lose a few and so you can decorate or create your own cards. You can keep the crystals in the small extra resealable baggies. Ameli did really well and I was pleased that this set managed to keep her attention. 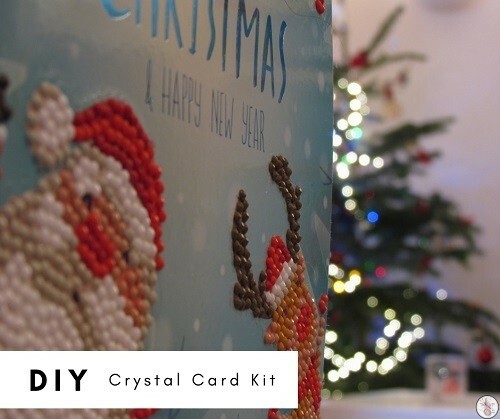 When you’re done you have a sweet, large sized card with 3D looking embellishments and an afternoon doing something different in front of the Christmas tree. We received a free card kit in exchange for an honest review.